What and how for this our Malaysian forever loved and forever inviting and forever fab (Honeydew Sago & Sago Gula Melaka) Bubur Kacang Hijau? My god! Seriously guys, the easiest, yes, the easiest dessert anyone for the matter can make. In other words, what is so complicated with simmering the ingredients listed below and these are the ingredients available at the snap of our fingers in our country, of course in other Asian countries as well, and these days, ingredients have traveled and landed all over the world. Meaning, if not all, some ingredients are available in Western and far out countries too (Watermelon Sorbet & Rava Kesari). But local produce is definitely cheaper compared to those imported ingredients? And my style to desserts as you know, mostly is Malaysian calling, though every now and then I do include those the rest (Chocolate Cheesecake, No Bake Cheesecake & Poached Pears in Citrus Syrup). 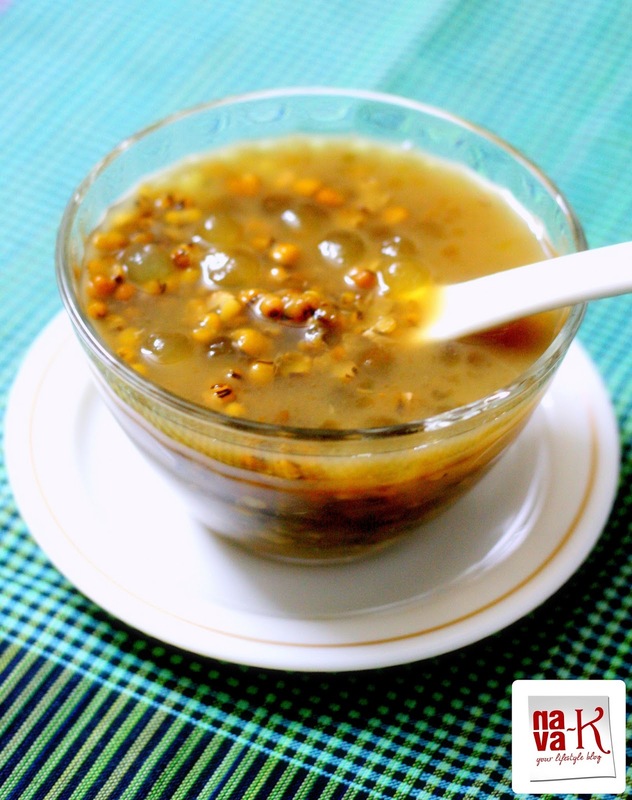 Bubur Kacang Hijau, aka Green Bean Porridge? Green beans, sago, pandan leaves, palm sugar, coconut milk and salt. That's it. Slurp in everyone.I bet you will truly enjoy every bit of this Malaysian sweet pleasure (Pandan Jelly Coconut Milk & Coconut Panna Cotta). 2 cups green beans/kacang hijau - soaked in water for at least 4 hours and drain off water. 1/2 cup sago - soak in water for 1/2 hour an hour. Then gently rinse under running water without breaking up sago and drain off excess water. Add beans, screwpine leaves and 1 liter of water into a pot. Simmer till beans are 3/4 soft. Add sago and gently stir. When sago becomes translucent, add both types of sugar. Before serving, remove screwpine leaves and pour coconut milk in. . Serve hot or at room temperature, or chilled in the fridge or top up with ice cubes. Also the simple porridge looks yum and healthy!! I always prefer(if given a choice)a liquidy or semi solid dessert, becomes it is light on the tummy and not over-the-top like the crazily sweetened desserts. It's true, blogging do take up a lots of our time. Sometimes feel like giving up but then the thought of already come to this far and spent some much time and effort on it, hard to let go. And I do meet a lot of wonderful friends thru blogging including you....and your wonderful recipes. Dont take a break and keep writing when you get time. Hey this bean porridge looks so tempting. SO new for me. I am not year old blogger and still think how people managed thru years. Love porridge. Delicious bowl of porridge :) Keep Blogging!! The bean porridge looks new to me.. It is so healthy and tempting.. The bean porridge is simply superb. We are all sailing in the same boat, you found the right words to put it here. This porridge is new to me. Looks delicious though. I am sure it tastes good too. Hang on - and keep up the good work. Lovely bean porridge ,interesting ingredients.Awesome click.Was an interesting write up. Nava, keep going u are really so good at blogging,an intro or not the dishes are really unique.I would love to see more of ur innovative dishes. as for me, after 5 years, I just need a mood only. At my age now, I've had quite a lot of experience and a story to be written...as a caterer I cook every day, variety of foods, there are times when I lose the mood so I just let it all go by, but I'll feel regret later...I should have made ​​the event today in order to be a memory for tomorrow, probably just enough each post with just a picture ...sometimes a picture is worth a thousand words...you agree with me dear? have an intro or not is not the question, what is important we have served with a bowl of bubur kacang that was so tantalizing by someone called Nava! Keep on writing dear and dont give-up! Blogging should be fun Nava not the taxing one. So take your time and enjoy both life and blogging. 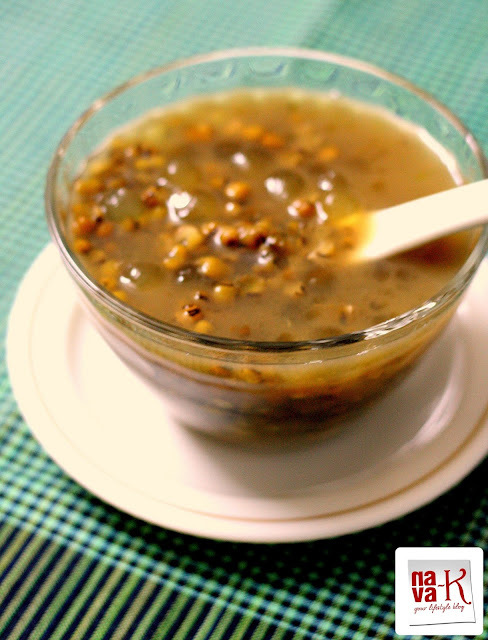 This Green beans porridge looks similar to our payasam. Looks yummy. Nava, Its true blogging does take lot of time, although I do not visit that many blogs or on any of the social media network but still I find it is taking all of my time. This year I have reduced my visit to other blogs and post only when I get time.I don't have small kids but my social life, work, volunteer work keeps me so busy that I often do not get time to go on computer on weekends. Once I am on computer I forget all around me. These are mung beans, right. I make it a lot almost once every week for sure. Its interesting to read the sharing, opinions and comments on blogging. Thanks so much. Nava, you just shared the same thought as I do..:-) and the porridge looks delicious! Yummy! I normally make it plain without milk or coconut. But when I do add coconut and if durian is in season, I will add in durian since mum loves it that way. well said nava.. sometimes blogging gives too much stress but at the same time it acts as a relief too :) take your time and dont stop blogging..
Used it more to make dessert (green been soup).I have never thought of tt - porridge! You're so right about the blogging habit. Although I've turned to food blogging now I was earlier writing a nature/plants blog. I enjoy going through your recipes. This is new to me and it does look delicious and refreshing. Nava, How do you manage to speak your mind soo clearly... I want to share something with you... As you know, I'm new to this blogging world and am getting to know soo many new bloggers here and learning something new everyday... When I got introduced to your blog.. My first thought was.. Oh my! She rights sooo well... And then I started visiting your blog regularly.. You have a great command over words Nava and they are not just simple words but I find them magical.. The way you make a simple porridge or soup sound divine... Your perfect photography.. When it comes to writing a comment to your post, I feel like a child in front of a teacher... Don't know how to give my opinion.. You are one of my favourite bloggers.. You are an inspiration to soo many bloggers out here... Would love to keep coming back here for more... If you like do take a break but come back when you're free and when you start missing the blogging world... The porridge looks superb Nava.. Healthy and pleasant.. Perfect for all times..
Really yummy luking n porridge..
Love this porridge . Healthy too . very interesting & delicious porridge ! I can understand it becomes stressful for us if we have a job. But at the end of the day, it is something that we love to do. So buckle up your spirits Nava & keep doing what you love to do. Very sedap, Nava! I'm not sure I've had one with sago in it too, looks yum!